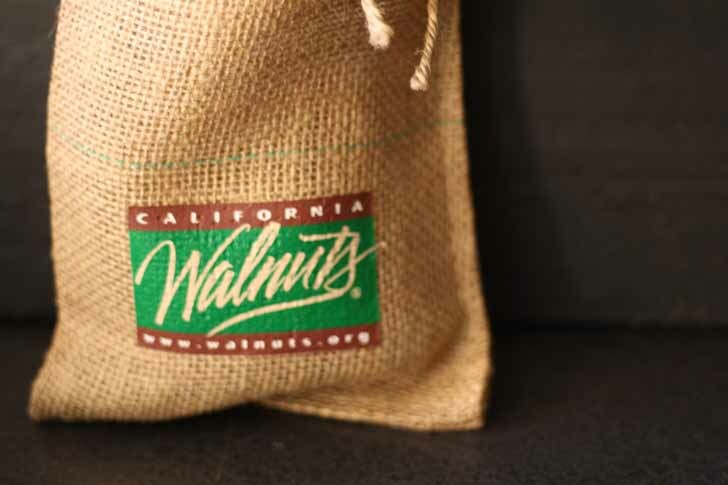 Disclosure: California Walnuts supplied me with free walnuts but I was not compensated for this post. 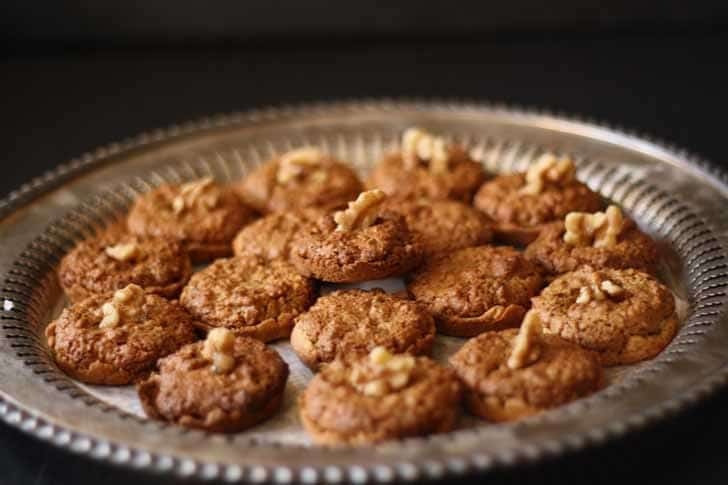 These walnut cup cookies are a great dessert – enjoy one of these nutty cookies with a cup of tea and I guarantee you’ll be back for more. A few weeks ago, I received a note from California Walnuts asking if I would like some of their walnuts… you can guess what my quick response was. YES PLEASE! When they arrived I was so excited and they came in the cutest burlap bag. It made me want to jump head first on the burlap trend train. Lately, I’ve been looking for healthier options for snacking, and nuts such as walnuts are a really great alternative to chips. Seriously, I have a love of chips and sometimes I feel like I just can’t quit. And then a bag of walnuts shows up at my door. Bam. Someone must have heard my cries as I stepped on the scale after that last bag of Doritos. Back in November, I asked my mom if she had any recipes she could share with me, that I could share with you guys here. 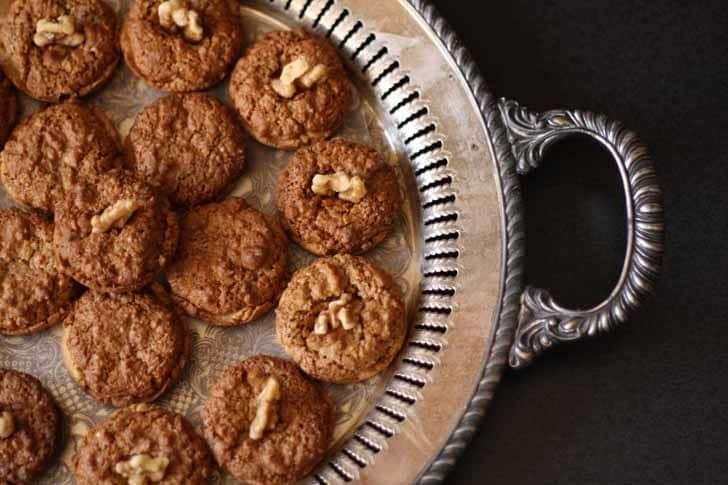 I was looking for a cookie recipe that I could use for the Food Blogger Cookie Swap I participated in. The only thing I asked from her was that they were original family recipes. You may wonder why I would ask this of my mom – she has one of the largest cookbook collections I have ever seen. Hundreds and hundreds of them, which she pours through looking for the next best thing she can try. She is my biggest fan for sure, trying out all of my recipes and the recipes that I share in my 8 Great feature each week. She sent me a number of recipes and I tried out each of them. I think both sides of my family had the baking bug because each recipe was amazing!! 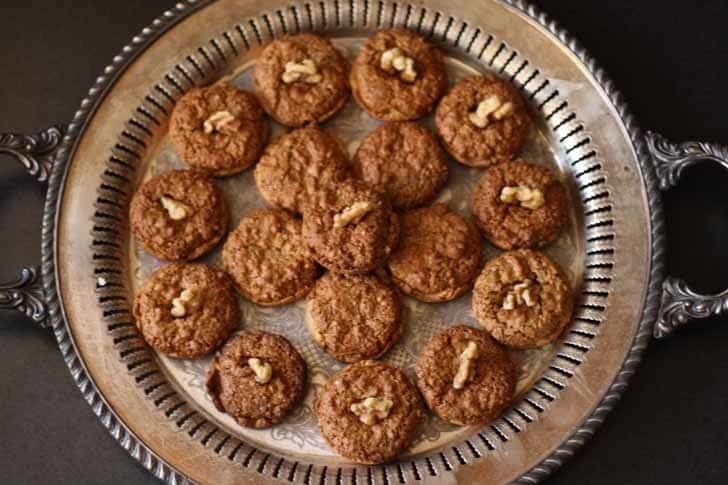 I made each one and then zeroed in on this one – walnut cup cookies. The recipe she sent me was rather vague – one of the ingredients was 2-4 teaspoons of sugar. Haha, can you imagine if I shared it that way with you? So, instead I experimented and this version below was my favorite one. It’s very nutty, sweet but also a little savory. I think you’ll like them a lot – Mr. B.’s coworkers LOVED them. I had multiple requests to make them again and he brought in 4 dozen cookies last week. 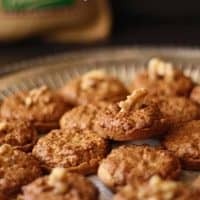 Needless to say, I think those guys would come over for tea and cookies if I invited them as long as the cookies were walnut cup cookies. 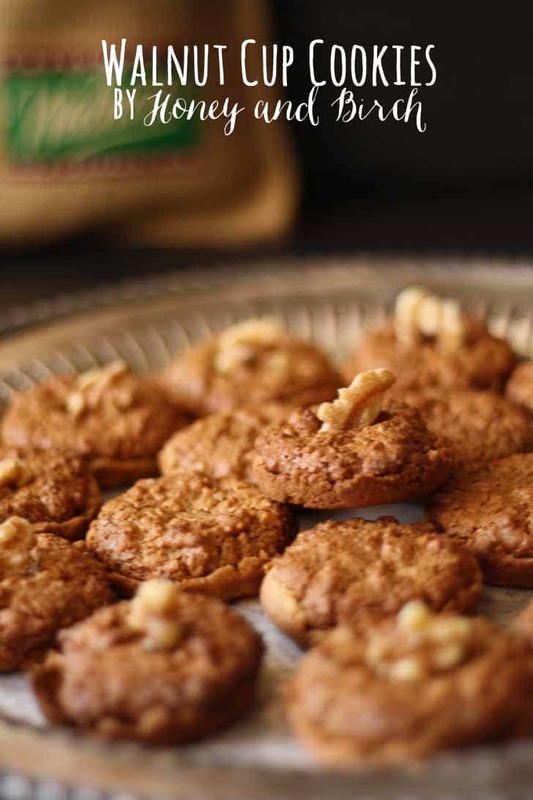 In a stand mixer, mix together 1/4 cup butter, flour, cream cheese, 1 tablespoon brown sugar and white sugar. When thoroughly mixed, add the melted butter until combined. Form 24 balls with the dough. Place each ball into a regular muffin tin hole and press into the tin. Set aside. Combine the remaining ingredients in a bowl until well mixed. Fill each cup evenly until you have used all of the filling. Bake for 15-20 minutes until edges begin to brown. 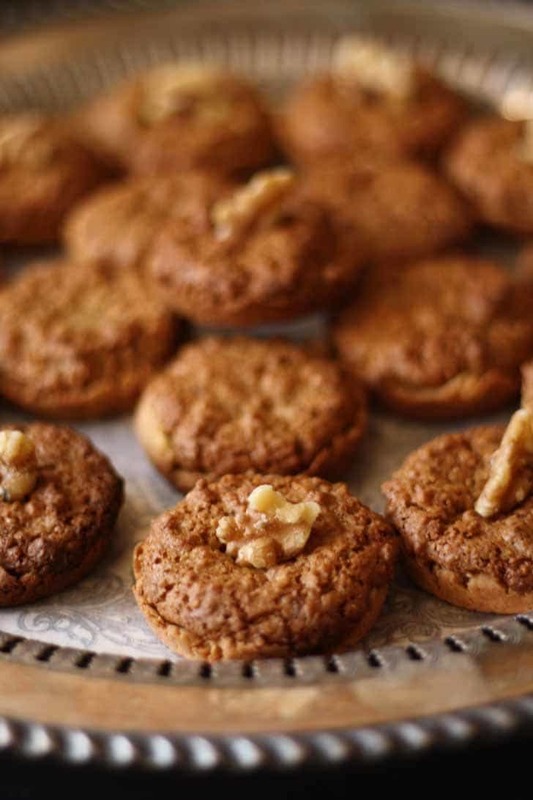 If you want to decorate, press a walnut into the top of the cup immediately upon removing from the oven. These sound and look amazing. Thank you very much for sharing with us. Walnuts are my favorite. Would love to try this recipe out some time! These looks so good, definitely going to try these out sometime! 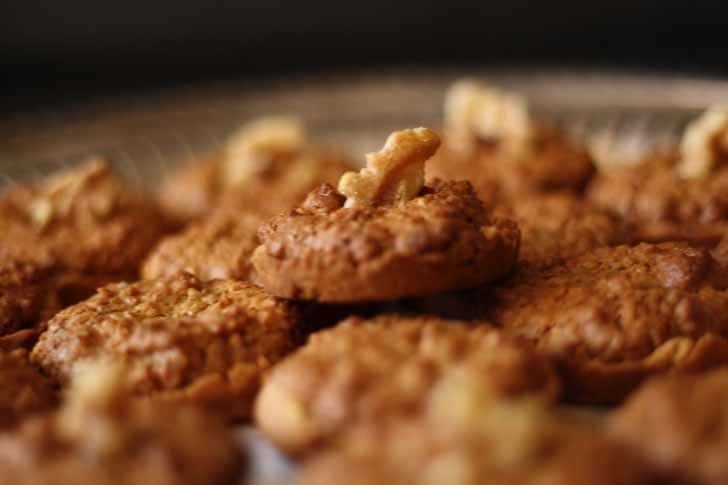 Your cookies look absolutely delightful Jenny! I think they would be perfect for an Afternoon Tea Party! Thank you 🙂 They taste yummy too!